I was not able to reproduce the error on a Windows 7 Pro and a Windows 8 Pro system though which makes it likely that something else needs to be causing the issue. Google is tracking the issue since Chrome 37 Beta on Google Code but it is not clear if and when the issue will be patched. Two temporary fixes have been discovered for users affected by the issue. Find the Chrome icon that you click on. It may be on the Windows taskbar, a shortcut on the desktop, or in the start menu or on the start screen. Right-click the icon and select properties from the context menu if the icon is on the desktop or start menu/screen. If it is on the taskbar, right-click Google Chrome in the context menu that opens up and select properties here. 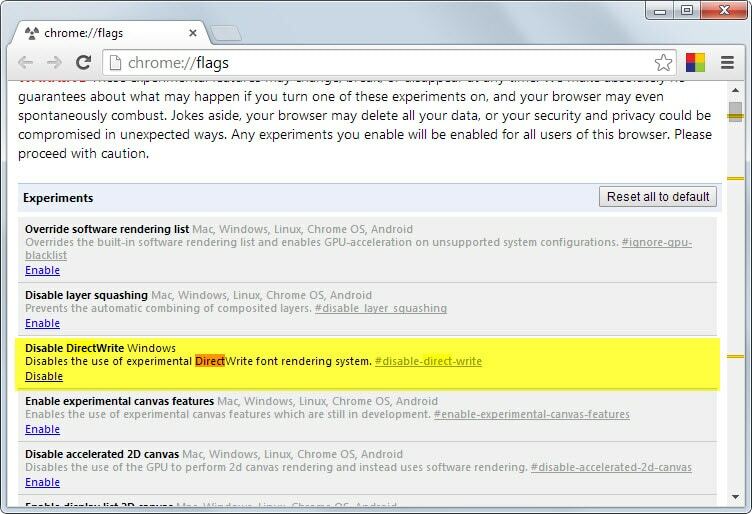 When you restart Chrome afterwards, it will use the parameters and should display fine and without issues. You can disable DirectWrite on the chrome://flags page. This forces Chrome to return to the previous renderer. Load chrome://flags/ in the browser's address bar. Locate Disable DirectWrite on the page, for instance by hitting F3 to open the on-page search option. Click on the disable link, this turns it off. The third and final option is to set the DPI setting to 100% instead of the value that you have set. Doing so will however impact all windows and interface elements on the system, not just Chrome. While on the desktop of the operating system, right-click on a blank spot and select Screen Resolution from the context menu. On the window that opens up, select "Make text and other items larger or smaller". Switch the setting from the value it is set to, to 100% default. You need to log off and on again, or restart the computer before the change takes effect. How to fix if Chrome displays blurry text or looks zoomed in. Google has changed text rendering in Chrome 37 and as a result, some users report display issues. I use to face same problem but they fixed that issue in version 38 dev and end dates so I don’t know whether it made to 39 or 38 but either one of it fixed for me. Solution #1 working for me Parameters. WIndows 7 64 bit using Chrome with dual monitor 1600×900 and 1920x 1080 resolutions. Since early 8/27/14 had issues with Chrome (Zoomed in and Blurry). I do use custom 143% DPI settings for desktop and NEVER had problems with Chrome text size before yesterday. Thanks for the fix. I am running Chrome Version 37.0.2062.94 beta-m (64-bit) with no issue of zoom or blur. Some sites look much better since adding DirectWrite support. Woke up this morning to an ugly Chrome, and came up to this article from google news. I’m running Chrome Version 37.0.2062.94m using Win7 with a custom DPI settings (121%). fix#1 – it was already disabled for me, so can’t use it. fix#2 – worked right away! Have noticed (just now) when on twitter and connecting to a hyperlink that Chrome pops up with the over sizing and bluriness, but not when I start the browser itself. Interesting. Hope the next version will fix this bug. PITA to play with even for a tinkerer. Both sollutions doesnt work for me, i tried it multiple times.. with not effect!! Remember, you can always change the icon text size in the advanced options in Windows. Go to Control Panel -> Display. You’ll see at the bottom: “Change only the text size”. There’s a drop-down menu which you can select the icon from and change the text sizw from there. Sometimes it may take more than 1 try for Windows to “apply” the setting. You might have to restart your PC if it’s really stubborn. But that setting should fix the small icon text issue permanently. Guys: EXIT chrome after applying the fix #1. It’s still running in the background, and you can exit it on the bottom right corner. DO THIS before reporting that the fix does not work!!! Working fine on Windows 8.1 Home Premium 64-bit. It looked like it always did. Does enable turn it off (directwrite off) or disable to turn off? When you select the disable link, you always turn the feature off. None of these settings worked for me. Went to the control panel to check my ClearType settings. Turning on ClearType and restarting Chrome – world of difference! Clear Type is a Windows setting. Right-click on desktop, select Screen Resolution, then Make Text and other items larger or smaller, and then on the left adjust ClearType text. THANK YOU SO MUCH. METHOD ONE fixed it for me. Been stumped for hours on this annoying bug. VERY noticeable blur on Windows 7 home premium 1080p. Thanks it was driving me crazy! How can I get solution #1 to apply to desktop shortcuts of websites? It fixed it for when I click on my Google Chrome icon, but if I click on a website shortcut on my desktop, it goes back to the blurry version. Thanks, Method 1 fixed it for me, i have 125% on the media pc, and this was so dammed annoying Method two wouldn’t work for me though. Yes, I have 125 too. So far two of my machines have the blurry font issue. They both have various versions of Intel HD graphics on board. Fix #2 works on this machine. I’ve yet to try the other one that’s blurry. If a shortcut’s properties has “chrome.exe” in its application target field you’ll need to add the flags to the end of the command line. You’d need to do that for each shortcut. Otherwise you’d have to modify the registry’s URL handler command line using REGEDIT. That could get ugly. When I right-click on a shortcut, I don’t get access to the Target field at all…. cjearner, do you have any ideas why I don’t get the “Target’ field when I click on a web page shortcut on my desktop? Any ideas on a fix for that? You might be able to modify the url handler in the registry. You’d have to append the flags to the command line there. Version 39.0.2140.0 (35f985b3b838) (64-bit) !!! I just tried 39.0.2140.0 and it was NOT fixed there. “Out of the box” is was still enlarging all graphics and fonts (for me with Win7 and 144% custom text size). Hi Pierre, I couldn’t reply to the comment you left on my question for some reason, so I’m asking it here. I have no ‘Shortcut’ tab. The only tabs I see are General, Web Document, Security, Details and Previous Versions. Was is your system ? General, Web Document, Security, Details, Previous Versions. That’s what I get when I click on google chrome, but not a shortcut. It is NOT fixed for me in Version 39.0.2138.3 dev-m (64-bit) which is the latest 64-bit version. Where does your version come from ? Is it the last dev ? Where should I be going for a fully working version? Pierre… No, I am not deliberately used a dev version. I went to the link you provided for canary (thanks), but here is what it installed: Version 39.0.2138.3 dev-m (64-bit). Any idea how to get the version you suggested other than that link? Also, please note that I am using Win7 with 144% dpi. This now seems to work directly from the icon and from links in email, giving normal looking webpages. I was just going to tell you this, that now I have two versions of Chrome! UGG. The new one is: Version 39.0.2144.2 canary (64-bit), and it is enlarged too! No fix for me (with 144% dpi in win 7). And yes, my computer is 64-bit. This is just completely frustrating. With 144% i don’t know, I am in 125. If I were you, I would expect for a more permanent fix, using Canary and… there are other excellent browsers ! You should not have uninstalled the main Chrome : why did you do it ? I had no idea that Canary was a test version…. I thought it was the real thing, maybe renamed to distinguish the 64-bit version. So now you seem to be suggesting that I reinstall regular Chrome (if I can find it), but make Canary my default browser (since regular Chrome has the scaling problem still)? At least at the moment, Canary is working as my default browser, such as when I click in an email, it opens. Is there some harm as it stands now? I can’t use Firefox because of longstanding scaling issues, and IE has been sluggish. I have even had to revert to an older version of Thunderbird to avoid the issue in their latest versions. I see you have many problems, Edgar. You should continue in a technical forum : there are a lot of them. I’m afraid this page is not made for it. Thanks so much man!! The 1st one worked! The Disabling Direct write solved the fuzz but Fix#1 didn’t solve the enormous tab buttons issue… It seems this started yesterday when after a W7 64bit system crash whilst the laptop was in Hibernate(! ), it rebooted and somehow Chrome upgraded itself to vers 38 even though I have auto updates off for everything! AFAICT, fixes #1 and #2 apply to MS Windows only. Are there equivalent options for Mac users? I have relieved the problem somewhat by de-selecting Hardware Acceleration in Setting >> Advanced, but I wonder if there’s a better trick. thing between 150 and 190 hexadecimal. Now all the fonts are very thick & very dark in Chrome Browser. I have no issues with single monitors or dual monitors when connected via a digital connection. But we have a large number of users with dual monitors where the second monitor is connected via a VGA (first is digital). On the second monitor the text (just in chrome) is not smooth and it’s quite a bit fuzzy. Cleartype is on and has been adjusted, displays are all at 100% and resolutions are all the monitors default/recommended. Latest Chrome update (version 40) has resulted in fuzzy text on my Dell with 1280×1024 monitor. My cheap HP laptop is fine. Is this related to the mid-2014 update, or different? I’ve tried the solutions above, and no difference. ^RT. I also have a Dell with a 1280×1024 monitor, and am encountering fuzzy text due to version 40. Please help! From another site, the cure seems to be to set windows update to manual and remove the KB3013455 security fix. It apparently is a Microsoft problem with this patch on Vista. You’ll need to check when an updated patch becomes available, and also manually install any required patches until that time. Thanks for sharing this. Recently the fonts started to look fuzzy and blurry in Chrome on Kubuntu 14.04.2 LTS. Could you provide some more detail on how you did this in Kubuntu? I am going into the properties, but do not know where to append the command. Thank you in advance! FINALLY! Sweet relief from fuzzy fonts. Hello. Thanks for your post. I recently switched from Firefox to Chrome, and the font issue was quite noticeable to me…more on some websites than others, but noticeable on most websites. In the original article/post, I tried #1, #2, and #3. None of these worked for me. I’m running Chrome Version 50.0.2661.75 m, Windows 10, clear type is “on”, and my DPI was already set to 100%. I also tried RaoYv suggestion, but that didn’t work either. I don’t like using extensions, unless absolutely necessary (just more stuff to muck-up my system). In this case, I found an extension called Font Rendering Enhancer. It makes all the difference for me. That extension allows me to adjust the font width; its default is 100%. I’d be more than happy to ditch the extension, if something else worked.